The wavy patterns of orange, lime green and dark blue on the spongy surface of a nautically themed playground are the first indicators the new playground is unlike any other in Buffalo. But there are other indications, too. Like the large cubes, a slide and climbing apparatus, a large tire for kids to push. “This is what play should be like – running, jumping and climbing while developing gross motor skills and creativity,” said Jennifer Stringfellow of the Town of Tonawanda. She was at the playground on the Outer Harbor with her daughter Audrey, 7. As if to prove her point, six kids in a frenzy of energy pushed the tilted tire while three girls stood on it, trying to maintain their balance. The playground is in the newly created Buffalo Harbor State Park that includes Gallagher Beach, across the road from Tifft Nature Preserve. The site was also planned with parents in mind. There are three stone sitting areas with sails overhead for shade. Two nearby pavilions for outdoor eating and new bathrooms were also installed. Her son Ronan, 9, was having a blast. The playground’s pull was apparent, with more than 50 children on the playground, including students from Our Lady of Victory in Lackawanna, with none wandering away. 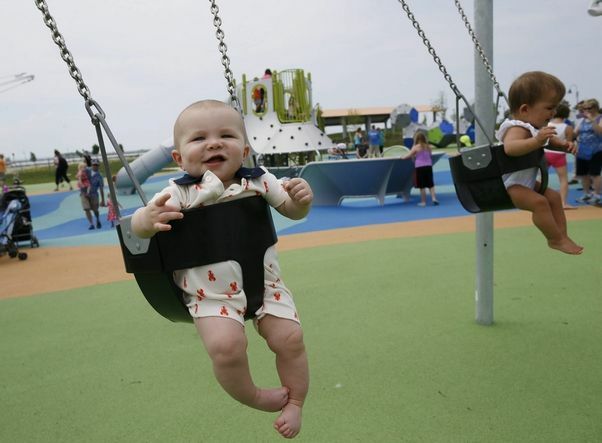 The new playground, developed by the state Office of Parks, Recreation and Historic Preservation, is one of many changes occurring on the Outer Harbor. Wilkeson Pointe opened in June 2013 and the park has become a popular destination. The Small Boat Harbor’s new owner, Safe Harbor Development of Knoxville, Tenn., has promised $10 million in upgrades over the next five years. The Buffalo Lighthouse, long closed to the public, has been reopened. New installations by the Industrial Heritage Committee celebrate Buffalo’s history of grain elevators, and the Queen City Bike Ferry began May 22, transporting people between Canalside and the Outer Harbor.